Hoosier Farm Babe : The day I almost lost my finger! The day I almost lost my finger! With everything else going on, I somehow took forgranted the swelling of my poor hands due to this pregnancy. I've always had bony little fingers and could slide my rings on and off freely - until one unfortunate morning! First - I tried soap and water - and no go - definitely no go! 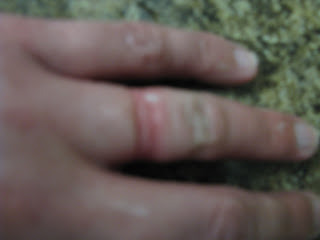 I got the rings close to the little knuckle and my finger started turning red. Ouch!! So I used my circle of friends on Facebook to collect ideas and put 'em to work that evening! One, Two ... Three ... Success At Last!! 1. I made a bucket of icy water and held my poor swollen hand in the water for 10 minutes. 2. Then I held my hand up in the air for another 10 minutes. 3. Because I had received (Facebook) suggestions for both - I took a combination of Dawn dish soap and Olive Oil and lathered my poor, cold swollen hand up! 4. 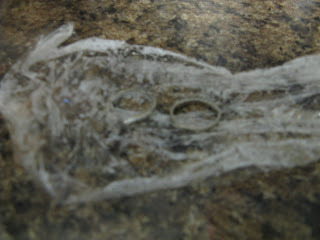 I wrapped my finger in saran wrap to get a better grip on my rings. 5. I slowly and painfully started twisting the rings toward freedom. Once I got the rings halfway off I found them stuck on my little knuckle. By this point, my finger was turning a shade of beet red, light purple. I knew at this point if I didn't get the rings off soon - I may lose the use of my entire ring finger. 6. So painfully, I keep twisting (and praying!!) 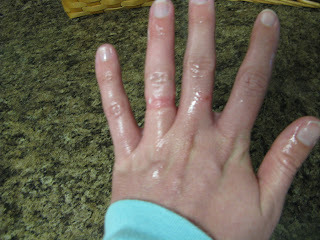 and eventually wiggled my wedding rings off my poor, cold, soapy, oily, swollen finger. 8. FYI - next time, check my rings a little earlier before it's gets to the point of no return! I had no idea they were digging into my finger as bad as they were. How Scary!!! So glad you got them pulled off! Maybe you should put them on a chain and wear them around your neck till the little one comes. Ouch- that just looks painful! Love the blog, I'll definitely be back. So glad you got them off! Pregnant in Indiana in the summertime - I had nearly forgotten - there is no better prescription for swelling on the face of this planet. Glad to see they didn't have to cut the rings off. That would have been NO fun. I know it's not funny, but this post does make me laugh. Just wanted you to know I passed on the award you gave me today and gave your blog a shout out. Thanks again for thinking of me.